Is there a room that wants to be refurnished by you? Do you want to change the colour of your walls? Your furniture wants to be moved? That’s not that easy. Room sizes are overestimated, windows are forgotten and necessary paths ignored. It is difficult to push furniture from one side to another; it damages the floor, walls and furniture pieces as well. Moreover you’ll have to choose the right piece of furniture still. Online furnishing planners help. They make it easier to choose suitable furniture and they allow imagining colour, material and furniture combinations before you bought something new. We tested and compared five promising room planners for you – they’re free and directly usable online. The five online room planners were rated considering operability, design, exactitude, repertoire of templates, scope of service and charging time – as well as with a total evaluation. One to five points were given, depending on the category (1 point = expectations weren’t met, 5 points = exceeded all expectations). Operability – Is the tool clearly arranged? Is the operation self-explanatory? Are the functions described? Are there helping tutorials of FAQs in case of doubt? Design – How attractive is the design of the tool? Does the design encourage an easier operation? Exactitude – Is the own flat faithfully recreated? Is there a possibility of integrating corners, bays and angles true to the original? Are furniture pieces also easily integrated in the original size? Repertoire of templates – How big is the repertoire of furniture pieces and accessories of the interior planner? How big is the broadband of templates? Are there only some classic pieces of furniture like armchairs and tables or are there fitness devices, children’s furniture and decoration objects as well? How exact is the recreation of the own flat with the repertoire of templates? Scope of service – How many functions and features are there in the tool? Is there a possibility of sharing or photographing the result? How much can be recreated and individualized? Charging time – How long does the tool need to charge some new adjustments? We furthermore documented the necessity of registering for the permission of using the tool and if there is a possibility of viewing the “room” in 3 dimensions and if there is a tool-expansion with additional features. The following ratings are based on a subjective assessment regarding our personal expectations for interior planners and we therefore don’t claim for completeness – all information is supplied without warranty. We tested the interior planners in September of 2015. The RoomSketcher is noticeable because of very detailed design possibilities: There are numerous floorings. Even the floor work direction is individually adaptable and baseboards plannable. The floor plan and the dimensions of the single furniture pieces are precisely describable and accurately introducible. Big plus point: There are numerous furniture pieces of the Connox style – among them design classics like the Egg Armchair and some other products by Arne Jacobsen. The all-including repertoire of templates also includes decoration elements and plants. Different planning steps – walls, windows, materials and furniture – are the reason why the RoomSketcher is very user-friendly. Projects can be saved and continued whenever you want. You will also be able to publish or recommend your projects online. 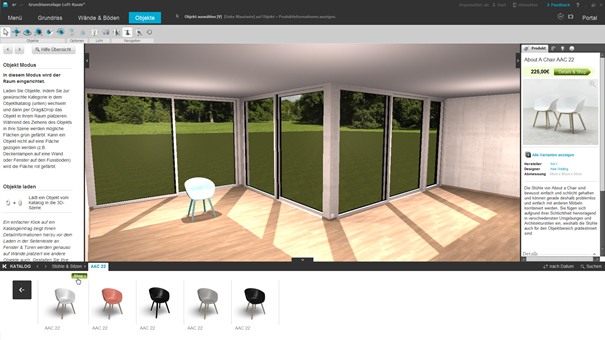 You will even be able to go for a walk through your new furnished flat with the 3D-view. The PlanningWiz belongs to the most comprehensive furnishing planners. Maybe the user therefore needs a small training until all of the functions are known. Rooms are recreated and organized with exactness with a comic-like style. Powerful, rather dark colours and edgy furniture encourage an old-fashioned look. There is a big repertoire of templates and furnishing items – more than only the classic and known pieces. However, many of these furniture pieces are two-dimensional and rather schematically. The floor is adjustable, but not so are the walls and the ceiling, since there isn’t a possibility of viewing the room in 3 dimensions. Finished designs can be printed, saved, mailed, exported as picture and shared immediately. PlanningWiz offers numerous functions regarding planning and it therefore overtrumps most of the other tools. Extension: Branding, adaptation of the user interface, etc. against additional monthly costs (price on demand). The Homestyler convinces with accurate panning possibilities and the all-including functions of the user interface. Adapt every element individually – even the thickness of the walls and the colour of the baseboards. Wall openings are as well plannable. Do you already possess a floorplan? Then upload it! The browser view is adaptable according to your demands, photo-realistic snapshots are possible and your project can be shared with friends in different social networks. Big disadvantage: Only real products and few brands can be chosen from the repertoire of templates. Since their size isn’t adaptable, it might be difficult to recreate a flat close to reality. The charging time is as well questionable: To move items requires patience. The easy 2D gratis planner is the most user friendly one. This is also ascribable to the limited scope of service. For those of you who like to get a rough plan of the best place for your furniture, you’ve found your furnishing tool. Different floorplans are already presented in the beginning, which can be changed regarding their size. Self-explanatory icons and an understandable structure of the control elements facilitate the operation. The sketch-like furniture can be adjusted regarding their height, width and depth. The height over the ground is as well adaptable. If you want to shop furniture after planning the rooms, you’ll immediately be able to create a digital shopping list. It isn’t necessary to sign in to use the program. You will be able to send your project vie E-Mail. This is a great tool for people without much time and without high demands on design. Roomle is characterized by high class, clean design. It only exists in English, but the functions are self-explanatory. The user is able to upload floorplans or to design them himself. Wall thicknesses, furniture sizes and ceiling heights are exactly adjustable. Even the colour of the single elements can be changed. However, the versatility of materials for the walls is limited. The ceiling isn’t changeable. Therefore Roomle receives three points for the repertoire of templates: There aren’t only classiccategories to be selected, like chairs and tables, but entertainment devices, fitness devices, fences and furniture for pets. Brands can as well be chosen: wogg and Moroso are two of them. Watch your furnishing in a 3D mode, if you like. A big point: Roomle is adapted to be used with smartphones and tablets and it can be downloaded for the iPad. Which interior planner is the best one? Which of the furnishing tools is the best one for you? The answer depends on you. If you prefer a room planner to replace your furniture, you’ll probably need the easy 2D gratis planner. RoomSketcher, PlanningWiz and Roomle offer a lot of possibilities regarding design. Look for yourself, since the furnishing planners are free and most of them usable without signing in. -	Light sources with different kinds of light and colours are also implementable and they can be switched on and off if desired. -	Sunshine’s intensity is adaptable. -	City flats or those in forests or at a sea – the surrounding can be changed. -	All of the furnishing objects are tagged with a colour, which is the reason why the products with a suitable colour are immediately shown. -	The repertoire of templates includes all possible household items – from the sofa to the highlighters, in different editions. -	There is a big assortment of design objects among furniture and accessories. By the way, the pictures of the repertoire of templates were partly created by us. You will get to the product inside of the home design shop by means of clicking on them. The 3D furnishing planner Roomeon isn’t really self-explanatory because of the big selection of functions. A helping tool will explain the design process step by step, with practical tips and shortcut keys. It is necessary to sign in. And: Your computer shouldn’t be older than five years and have a real video card, which supports high class 3D applications. As you see, there are numerous tools and freeware as well, which will help you to furnish and plan your flat. This is how interior design is easy. Enjoy changing the appearance of your rooms!